Experiencing crazy DUBLIN on St. Patrick’s Day! In fact we took this opportunity to head back over to Ireland and this time see more of the country as well as the main event in Dublin itself. We visited my ancestral home for the first time last year and had an amazing and busy few days in Dublin seeing almost everything the city had to offer. We also headed over to the Wicklow mountains as well as Northern Ireland including Belfast and the Giant’s Causeway. We landed at Dublin airport on 17th March 2015 at approx 9:30am and headed straight to the city, to the Spire hostel just off O’Connell street to drop our bags and head directly for the green cauldron! As soon as we stepped onto the plane the day began, the air stewards were wearing leprechaun hats, our fellow passengers had scarves and were draped in green, the Guinness was already flowing for the numerous groups of friends gearing up for what would be an amazing night! As our bus came ever nearer the city, filling up with more punters covered in green and orange from head to toe, the atmosphere was building. The roads in the centre of the city were shut and the bus trundled slowly through the sea of emerald. First stop after the hostel: buying our own party outfits! As I slung the Irish flag over my shoulders I felt my heart swell with pride, thoughts of the Griffins, the Bryans, and the Hayes, of my Irish blood and the realisation that this dream of celebrating St Patrick’s day in Dublin was here! Walking around Dublin the entire city was buzzing, the parade route lined up to ten deep in some areas and for a while we just wandered in and out of the crowds taking in as much as we could. Twelve o’clock was approaching and so we made our way down O’Connell street and managed to find our way into a viewing spot for the upcoming parade! One of the highlights of St. Patrick’s Day celebrations around the world is the parade, and or course Dublin has its own. Filled with weird, wonderful, wacky and downright random participants from all over the world it was a joy to be part of. It felt like one big street party with music of all kinds filling the air and everyone getting involved by dancing and singing! The place was completely heaving, all the roads were blocked and we were lucky to stumble upon such a good spot to view the Parade from. Floats from Germany, Mexico and all over Ireland began to whoop and swing past us. People were hanging out of windows, perched on statues, standing on the roofs of nearby buildings and clinging half way up lamp posts to get a view! It was in a word: Manic! More than half a million people swarmed the streets of tiny Dublin city centre all bathed in a sea of green and orange, I have never seen anything quite like it! The contrast in floats from oversized sweets and woodland animals, to military kilt wearing bands and American cheer leaders cemented this festival as one of diversity and creativity. The rainbow of colours filtering past spoke of fun, love and peace! Trumpets, bagpipes, drums and techno… the mixture of music coming from each float somehow seamlessly blended from one era and culture into another as people applauded and joined in! The sea of people in unison waved their tricoloured flags, jumped in their shamrock suits and cheered with their painted faced. Green hats all shapes and sizes were flying around and everyone in sight seemed to be filled with merriment… or Guinness! To describe the parade as random would be an understatement, foxes and fruit, lederhosen and loud speakers, rubber ducks and ringing cell phones that was the joy of it all, you really didn’t know what might turn up next! The emerald isle sure knows how to hold a party! Some of our highlights include the massive, but slightly scary techno spider, the ever so camp Dracula and the dancing leprechauns of course! A couple of photos I found on the internet uploaded on some of the Official Dublin tourist board social media page and taken from their double decker bus! We are down there somewhere!! So after the parade where else do you go on St Patrick’s Day in Dublin but Temple Bar!! This is where the atmosphere really did become electric and where the Guinness was flowing by the gallon. Everyone was in great spirits and the crowd had a real international feel with people coming from all corners of the globe to celebrate in Ireland. The crowds of people gathered down these tight pub lined streets all dressed in green was quite an amazing sight. It felt pretty cool to be part of that and to look just as ridiculous as everyone else! There are only certain times in life really where you can walk about in a jester’s hat and not get funny looks but instead a friendly nod of mutual understanding! The city and in particular temple bar had a festival atmosphere about it. That kind of crazy feeling that anything might happen and anything goes, almost as if this place is operating outside of the realms of normal society. Businesses and offices where all closed, everyone was out and everyone was having fun. It felt like this is how life should be, people arm in arm with complete strangers, singing songs and enjoying music together in unison. Pints of the black stuff were clinking together in all corners of every bar but yet unlike most weekends in a city centre in the UK it never felt like the atmosphere took a turn for the dark, instead the craic was in full flow and social and language barriers were being broken by all. To spend St Patrick’s Day in Dublin was a dream I had for a long time and really spoke to my sense of Irish identity I felt through my family roots. To see the city coloured green like this and so many people celebrating this amazing and beautiful country and it’s friendly, warm and welcoming people made me feel proud and lived up to all our estimations. I will be doing a full gig report at some point as I have with many of the other bands I have been to see but as it was a massive part of the day and actually the catalyst for the whole trip then I had to mention it in this post!! I’ve seen them at Leeds 2008, Download 2012, The Ritz Manchester 2013, Liverpool Academy 2014 and now Dublin Vicar Street 2015! 5 times…I kind of love them! I’ve got on stage with them in Liverpool and Dublin too! For those who don’t know, and I am guessing that is probably quite a few of you, Dropkick Murphy’s are a Celtic Punk band from Boston who have been around since 1996. I have been a massive fan since I saw then back in 2008 at Leeds Festival. They kind of combine my love of Punk and Rock music with my sentimentality over my Irish heritage as well as having some amazing tune and singing about issues close to my heart! Perfect! Anyway, this is the fifth time I have seen them and every time I love them even more! Back in 2014 I saw them in Liverpool and it really was an amazing gig. I managed to get to the front and get on stage during their encore (which is a signature of their shows). So when Paul got tickets for Dublin I knew exactly where I wanted to be for this special show! 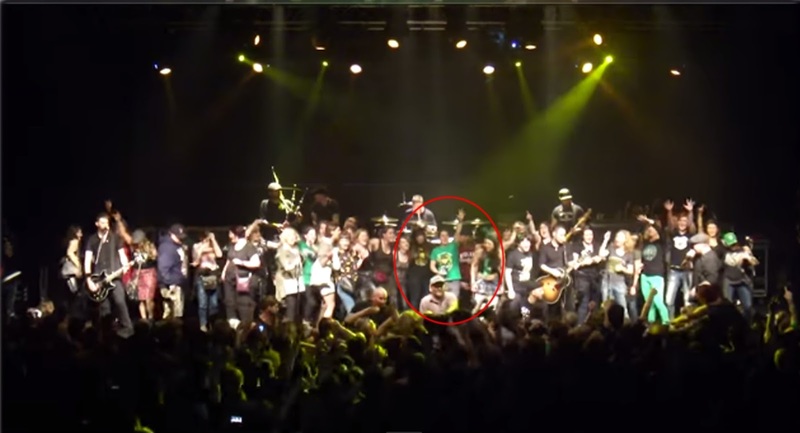 So yeah, seeing the Dropkick Murphy’s in Dublin on Paddy’s day was also up there on the bucket list, something that until 2015 had never happened before! We got there earlyish but we had got that wrapped up in the celebrations in the city that I thought my chance at getting on stage were gone. But hey, I’m small and have got my mosh pit forward shuffle down after so many gigs under the belt. If you can’t tell.. I got to the front! The atmosphere was completely mental, I’ve been to come crazy gigs in my time but this was up there with the most intense and of course, the best! People had travelled half way around the world for this and as a massive fan of the band I could hardly believe I was there! The encore felt like it came around way to fast and with a tap on my shoulder and a quick but least elegant leap ever I was on the stage again with one of my favourite bands! It was unreal! Dancing, jumping, kissing the singer on the cheek and swaying arm in arm with the other fans and staring out at the raucous crowd I had just been part of was the best way St Patrick’s day in Dublin could have ended! My ribs and arms felt the brunt of the gig and being on stage it was great to finally (kind of ) breath again! One of the things I really love about Dropkick Murphy’s is their connection to their fans and how down to earth they are. They let fans on stage to party with them every gig, they get pushed around, poked and prodded but just roll with it! Photo with Ken Casey on stage! Here I am in the red circle… mental! So there you have it, one of the craziest days we have had in our crazy travel life. We woke up that morning at home and ended it on stage! St. Patrick’s day in Dublin… if you get the chance head over there and jump in feet first! Bookmark this article Experiencing crazy DUBLIN on St. Patrick’s Day!